I can’t tell you the number of times I’ve said to my children, “what is impossible for man is possible with God”, “greater is He that is in you and me, than he who is in the world”, and “the Lord sure works in mysterious ways”, but what I can tell you is this, on one very certain day, love definitely felt “Stinky” for us. Here she was, an abandoned fluff ball, afraid of the world until she was nearing the end and we rescued her the first time. We brought her into the house, and within a short time she’d acted like she was meant to be- a member of the family. So now we had a house cat. 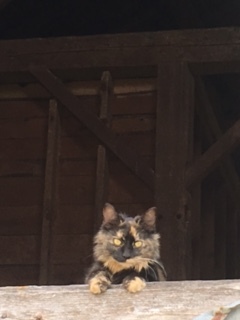 She had a very different color and markings compared to the other outdoor cats… browns, beiges, black, and an equally odd tail that she would parade in the air as she walked. (It may or may not have something to do with me stepping on it. 😉 ) It seemed appropriate to name her Cinnamon, until she used the litter box for the first time. My daughter called her “Stinky” and I said “that’s going to stick” and it did. She’s been “Stinky” ever since. So often, you could hear the voice of my daughter proclaiming that she was Stinky’s mother, and I, her grandmother. This, followed by my instant response “I am not that cat’s grandmother!” We liked to joke about it, but we both knew she had a very special place in her heart and mine. The kittens were about 5-6 weeks old, eating solid food and making friends. Stinky had enjoyed spending more time in the house again, where it is cooler, closer proximity to us and her special food, treats, and attention. None of the other cats have ever received the favor that she has had. And that has never been more true, than on August 4, 2016. While Stinky was running from one vehicle, crossing the street to return to the barn she calls home now, she didn’t have time to notice the car heading towards her until it was too late. I screamed ‘no’ as I watched my cat, whom we’d raised from a kitten, found cold and hungry, be thrown from the wheel of a white SUV (I don’t really know my cars, but that’s just what it had looked like in the brief moment I saw the vehicle). I’m not sure if the ‘no’s were directed towards the car, the circumstances, or God, but I screamed. Getting to my knees on the pavement, I watched as her leg twitched, eyes wide and glossed over while blood dripped from her nose and pooled on the asphalt beneath her head. Picking her up seemed like a bad idea, as I didn’t know if she was suffering internal damages, but I wasn’t going to leave her in the road. Thank God my brother saw me as he passed by a window from within the house, or else Stinky and I would’ve been stuck in the road for a while. The driver hadn’t stopped or slowed down in the least. My brother Mark had alerted my mother (who was making dinner in the kitchen) and both had run out to meet me. My mom, not knowing whether Stinky was dead or alive, scooped her up into her arms like a baby and walked her back to the house. Mark and I headed back after I re-lived the scene for him. He was shaken by all that had happened, too. So now, back in the house and after hearing my Mom’s side of the story, I looked into Stink’s face and watched her huge, horrified eyes dart back and forth. Her nose bled and dribbled onto my mother’s arm, and when mom had laid her on my lap, she wheezed and sneezed, blood splattering on my shoulder and neck. Eventually, the bleeding stopped and she became more aware of her surroundings. Stinky began to remember how much she dislikes being a lap cat and, despite my efforts, she hopped down. She was groggy and weak as she walked over to her food dish and attempted to eat some dinner. She spent that night sleeping under my mother’s love seat. Stinky is doing much better now. We “released her into the wild” a few days after the accident (three to be exact) when she appeared to be functioning properly (eating, drinking, using the litterbox with no issues of discoloration in the litter). She has a (weaned) kitten that lives across the street, so she was eager to be reunited with him. It is a miracle she is still with us. Stinky still seemed a tiny bit sluggish that first week, but overall she was acting like her normal, lovable self and is happy to be home again. I dropped what I had in my hands and joined him in hot pursuit, not knowing what I would see. There she was, laying in the middle of the lane on the other side of the road… “Hannah!” And I knew, there must also be a “loved one” underneath her. I had so hoped that it wasn’t our nearly 1 year old rescued and newly released house cat, but it was. It’s like riding on the fumes of faith, to me, when I’m in these situations. (And they are more often now.) I wasn’t emotional ‘at the scene’, even when faced with the tear soaked cries, wailing, and my daughter’s attempts to speak. But it thoroughly broke my heart to see hers in that condition. This was her baby, after all! Looking back now, I’m reminded once again of “walking by faith and not by sight”, so when blinded by my circumstances and paralyzed by impending grief, I can ride it out with Jesus. I somehow was able to move Hannah off from what she was cradling, and saw Stinky lying there lifeless (at the moment), beneath her. Hannah could barely cry out the words “It’s Stinky!” The kitten’s eyes appeared as roadkill and I saw no blood. If I had, I probably would have moved my daughter first. I immediately scooped Stinky up and cradled her in my arms like a baby. I walked back across the road to just outside the house, on the path to the front door. This is a familiar place to both Stinky and myself. I often work, read, and write outside in this place when the weather is sunny and warm- and she would visit me. When Hannah was ready to make the transfer of Stinky from me to her, the teenage kitten had a different plan. She jumped up on all fours and began to hobble around on the floor. It wasn’t long before she had made it to her cat dish and began to eat both the soft and hard food that was placed down for her. At one point, Hannah mentioned taking her to a vet and that she would pay for it, but that notion was quickly deleted, considering all that was done for Stinky already– our part was to trust Him to finish what He’d started. I did place a call to an emergency vet clinic to show Hannah that I valued her, per her request. Only to find out that they could do no more for her (except x-Rays and take our money), then we, with Jesus, had already done. Hannah got up bright and very early the next morning. The first thing she did was check on her patient. Stinky had slept underneath a large over-sized chair in my room overnight. As Hannah reached her hand under the chair (which sort of looked like a cave) not knowing what the outcome would be, her fears were quickly relieved. And her ears and heart were immediately delighted, at the sound of Stinky’s loud purr. By the third day, Stinky was itching to return to the barn across the road and her young family. We walked her across, left a day’s worth of food, and witnessed her reunion with The Fam. I can’t even begin to tell you how gut wrenching and heart breaking it was for me to see my child sobbing uncontrollably, stretched out and in danger as she laid in a small huddled mass in the middle of one lane of the road. It almost paralyzed me. But I attribute and “I give up” all that I am, the events that surround me, along with my children… to the Lord my God. Any and all glory goes to Him. It’s with His amazing strength, grace, and wisdom that I was made aware of the scene in the first place, able to see what was really occurring across the street, remove my daughter from it, and “behold” the rest… on that day and all those that follow after. 7 On the first day of the week, when we were gathered together to break bread, Paul began talking to them, intending to leave the next day, and he prolonged his message until midnight. 8 There were many lamps in the upper room where we were gathered together. 9 And there was a young man named Eutychus sitting on the window sill, sinking into a deep sleep; and as Paul kept on talking, he was overcome by sleep and fell down from the third floor and was picked up dead. 10 But Paul went down and fell upon him, and after embracing him, he said, “Do not be troubled, for his life is in him.” 11 When he had gone back up and had broken the bread and eaten, he talked with them a long while until daybreak, and then left. 12 They took away the boy alive, and were greatly comforted. 32 Now as Peter was traveling through all those regions, he came down also to the saints who lived at Lydda. 33 There he found a man named Aeneas, who had been bedridden eight years, for he was paralyzed. 34 Peter said to him, “Aeneas, Jesus Christ heals you; get up and make your bed.” Immediately he got up. 35 And all who lived at Lydda and Sharon saw him, and they turned to the Lord. 36 Now in Joppa there was a disciple named Tabitha (which translated in Greek is called Dorcas); this woman was abounding with deeds of kindness and charity which she continually did. 37 And it happened at that time that she fell sick and died; and when they had washed her body, they laid it in an upper room. 38 Since Lydda was near Joppa, the disciples, having heard that Peter was there, sent two men to him, imploring him, “Do not delay in coming to us.” 39 So Peter arose and went with them. When he arrived, they brought him into the upper room; and all the widows stood beside him, weeping and showing all the tunics and garments that Dorcas used to make while she was with them. 40 But Peter sent them all out and knelt down and prayed, and turning to the body, he said, “Tabitha, arise.” And she opened her eyes, and when she saw Peter, she sat up. 41 And he gave her his hand and raised her up; and calling the saints and widows, he presented her alive. 42 It became known all over Joppa, and many believed in the Lord. 43 And Peter stayed many days in Joppa with a tanner named Simon.